Pentaxians on the Web have been abuzz for months about the K-7, Pentax’s new midrange dSLR that replaces the now sub-$1,000 K20D. Though it shares a lot in common with its predecessor, there are some notable enhancements that might have Pentax photographers willing to step up, including significantly faster performance and video support, plus some attractive features for the brand-agnostic midrange buyer. 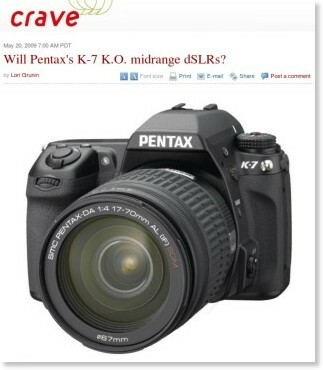 Pentax has announced the K-7 mid-level DSLR, based around an updated version of the Pentax/Samsung 14.6 MP CMOS sensor. The specifications – magnesium alloy body, 5.2 fps shooting, 720p HD video, 920,000 dot LCD – will not come as a surprise to the Pentax faithful, following comprehensive leaking of its details. However, we’ve been lucky enough to get hold of a pre-production camera to bring you a detailed hands-on preview of the K-7. May 20, 2009 – Pentax today announced the K-7 digital SLR with a new 14.6-megapixel sensor and 720p movie recording capability, priced at $1.299.95 for the body alone. Also new in this model is the 77-segment metering system and an enhanced in-camera shake reduction system that compensates for rotational movement in addition to the standard horizontal and vertical. Pentax Imaging Co. has today announced its new Pentax K-7 digital SLR, successor to the existing K20D model, and we’ve just published our Pentax K-7 preview.